As I mentioned in my earlier post A Cowboy’s Life is the Life For Me, at the Buffalo Bill Center of the West we strive to provide fun and educational programs for visitors of all ages. One such program is our Art in the Garden series (free with admission) in which we provide hands on activities and projects for kids to enjoy with their families. 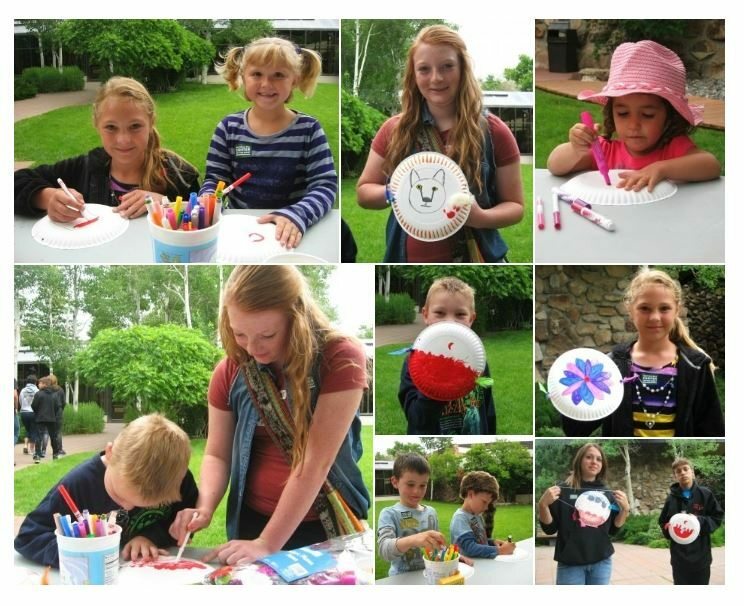 Our theme for the first week of art in the garden this summer was “Cowboys and Cowgirls.” The museum guests and I had a lot of fun decorating cowboy boots, creating popsicle stick cowboy and cowgirl dolls, and making our own stick ponies. The second week I decided to do Native American crafts to coincide with the Center’s annual Plains Indian Museum Powwow in Cody. 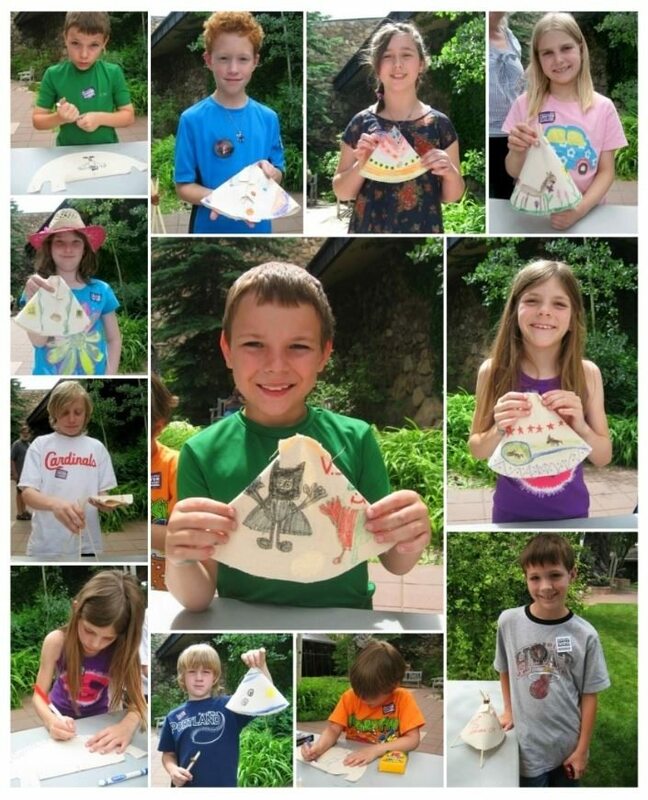 The families absolutely loved making these crafts and learning more about Native Americans. Below I have included how to do these activities at home. At the Center, we supply all the materials and the cleanup. So most people know that shields are important for protection. Did you know that the images placed on Plains Indians shields were lso extremely important? Some of the most popular symbols were animals, such as bears, which stood for courage; weasels, which symbolized cunning; or a kestrel, meaning speed . Plains Indians would also decorate their shields with feathers from various birds. First have your child decorate the paper plate. You can have them follow traditional shields by searching our online museum collections, or you can have them create their own design. On both outer rims of the plate (about halfway), punch a hole. Cut out a piece of string (about 18 inches). On one end of the string you want to tie a bead, making a knot. Next to the bead tie on a feather. After you tie the feather on, tie two more beads next to it. Take the opposite end of the string and weave it through the holes. When you reach the second hole, have your child see how loose or tight he wants the shield to be. Then knot the string on the second hole. Put the beads and feather on in a reverse order so that they are the same on both sides. First string two beads and tie the feather on. After that, tie on the remaining bead, making a strong knot. 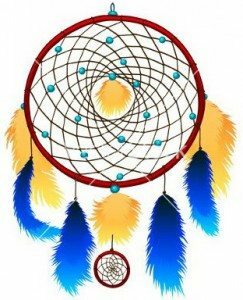 Dream catchers were used by some Native Americans, but due to their popularity and commercialization it can be hard to know what is fact and what is fiction. 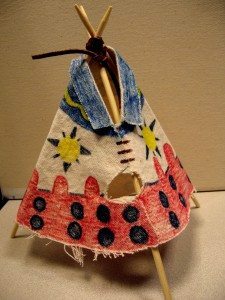 We do know that they originated with the Ojibwe, otherwise known as the Chippewa tribe, and were placed near children’s cribs to protect them from bad dreams . Even though they have a checkered past, they still are a lot of fun to create. 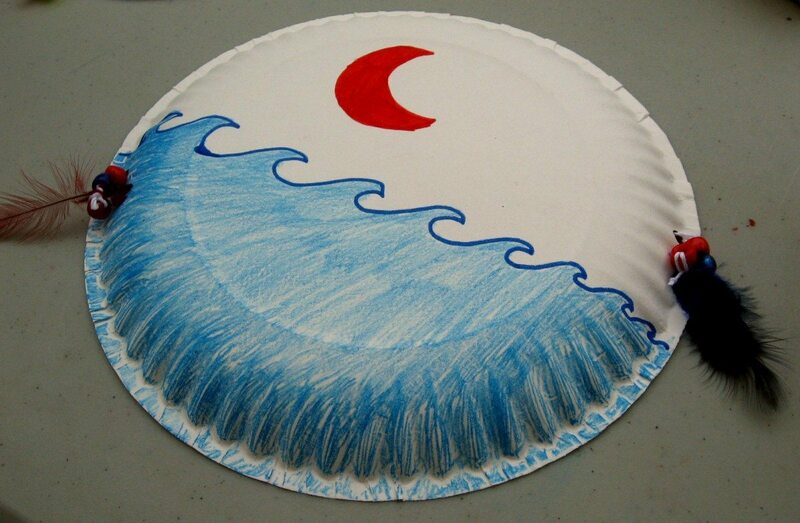 Take a paper plate and cut out the inside circle. Punch 8 holes along the inside rim. Make sure that they are an even distance apart. Cut a piece of string (about 42 inches). Weave the string throughout the holes criss-crosing them in the same manner you would tie your shoe. Try not to put the string in the hole right next to the one you just weaved it through. As you weave the string add on beads, putting on as many as you would like. When you reach the last hole, make a knot at the end. Next decide which is the top and which is the bottom of the dream catcher. On the bottom punch three holes about an inch away from each other. Cut three 7-9 inch pieces of string. 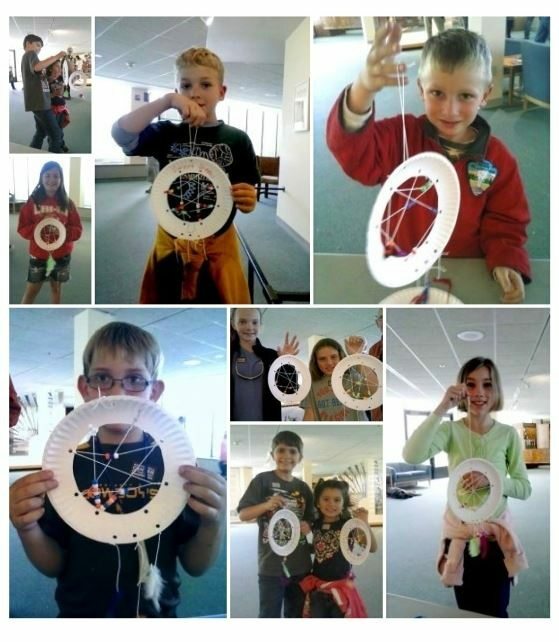 Take one piece of string and tie it onto a feather. Make sure the knot is big so the beads don’t fall off. 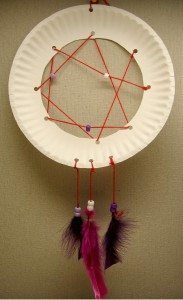 Then take the other end of the string, determine how far you want the feather and beads to hang, and tie the string around one of the holes on the bottom of the plate. Repeat for the other two pieces of string and holes. At the top of the dream catcher punch a hole on the outer rim (this is to hang the dream catcher up). Take the string and put it through the top hole, tying the two ends together so it can hang down. Color the plate if you desire. Some Plains Indian tribes lived in tipis, others did not. For those who did, the tipi protected them from the wind and rain, keeping everyone inside warm and dry. 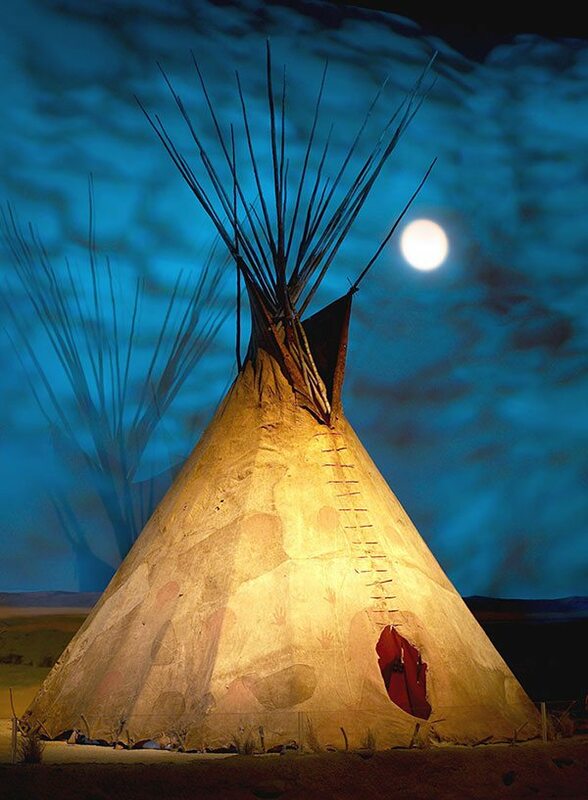 Many tribes believed in decorating the outside of the tipi, such as the Sioux and Blackfeet. The decorations used meant a lot to the family living inside . 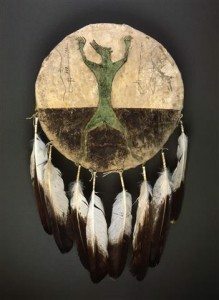 Some tipis had a hand (symbolized power), circle (symbolized the sun), crescent shape (symbolized the moon), triangles (symbolized mountains), or a horse (symbolized a brave fighter) . The special designs on a tipi could only be used by that family . Print and cut out template. Trace the template on canvas. 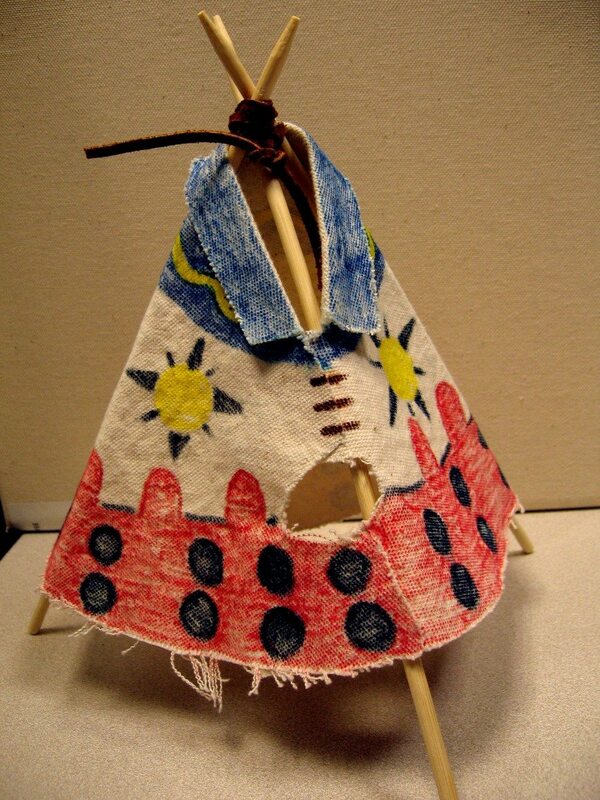 Cut out the canvas tipi. Decorate it. You can use paint, but crayons and markers work just as well. Glue the front of the tipi together like it shows on the template. Wait for it to dry. While the tipi is drying, take three skewers and some leather cord (you don’t need very much). Place the three skewers together in a bunch, pointy ends on top. Wrap the leather cord around the three tipis, a few inches from the top. Then double knot, but be careful; if you pull too hard, the leather will break and you will have to start over. Take the bunch and spread the legs out so they form a tripod. 1. Emily Buckles, “Wildlife in the West” (tour, Buffalo Bill Center of the West, Buffalo Bill Center of the West, Cody, WY, June 2, 2014). 2. Frances Densmore, Chippewa Customs (Washington, DC: Smithsonian Institution Bureau of American Ethnology, 1929; St. Paul, MN: Minnesota Historical Society, 1979), 113. 4. Buffalo Bill Center of the West Education Department. “Tipi’s Talk About Families.” Handout, n.d.
6. Buffalo Bill Center of the West Education Department. “The Origin of Blackfeet Tipi Designs.” Handout, n.d.
Buckles, Emily. “Wildlife in the West.” Tour, Buffalo Bill Center of the West, Buffalo Bill Center of the West, Cody, WY, June 2, 2014. Buffalo Bill Center of the West Education Department. “Crow Shield Cover (NA. 108.16).” Handout, n.d.
—. 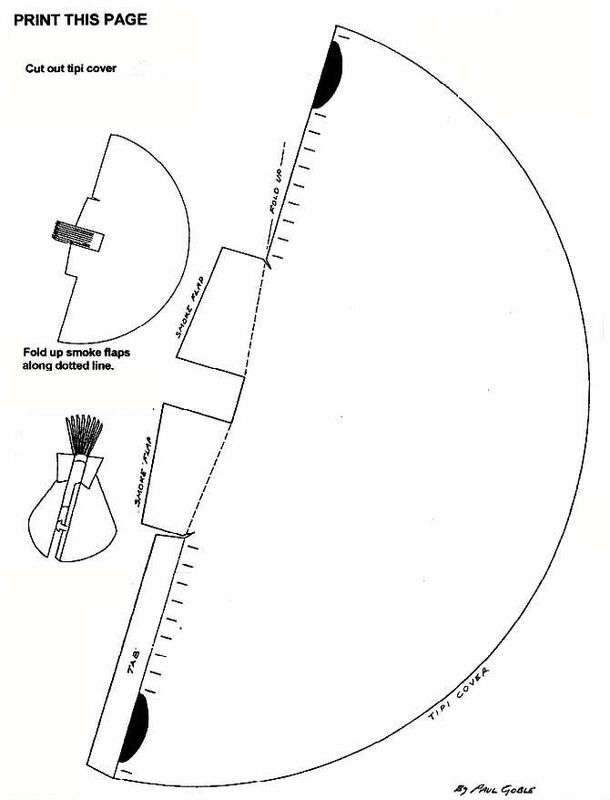 “The Origin of Blackfeet Tipi Designs.” Handout, n.d.
—. “Tipi’s Talk About Families.” Handout, n.d.
Densmore, Frances. Chippewa Customs. St. Paul, MN: Minnesota Historical Society, 1979. First published 1929 by Smithsonian Institution Bureau of American Enthnology. Digital file. “Portable Shelter for All Seasons.” In The Buffalo Hunters, edited by Time-Life Books, 124-33. The American Indians. Alexandria, VA: Time-Life, 1993. Leah Madsen is our current education intern at the Buffalo Bill Center of the West. Miss Madsen recently graduated from Sonoma State University in California with her B.A. in history and art history. While not a native to Wyoming, Miss Madsen has always enjoyed Western film, art, and history; and is excited to be a part of the team this summer.